A sweet to end all your meals with. One of the healthiest desert to make, chawal ki kheer or rice pudding can be made with minimal efforts whenever you have a bit of extra milk at home. . 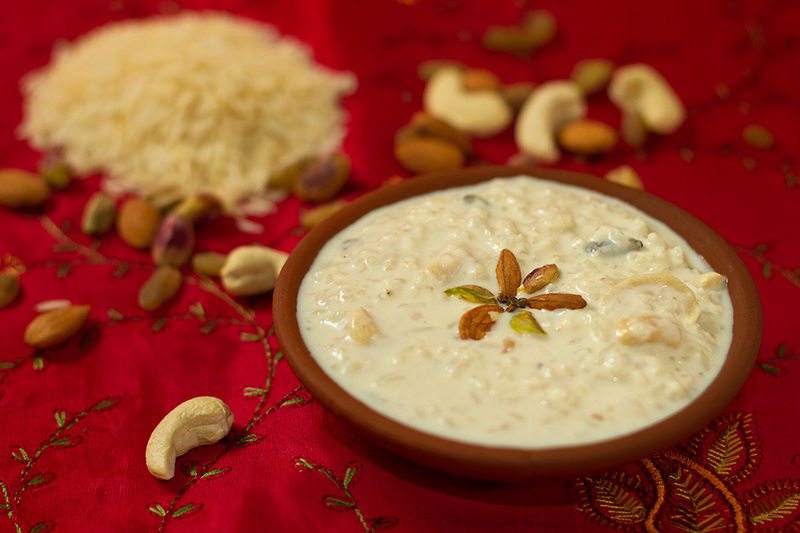 The slow cooked rice in milk makes the kheer creamy and the crunch of dry fruit adds a rich flavour. I often make kheer and keep it in the refrigerator, we are all very fond of kheer. Since I am a diabetic, I take some out before adding sugar for the rest of the household and have mine sugarfree. Kheer is a South Asian rice pudding made by boiling rice, broken wheat, tapioca, or vermicelli with milk and sugar; it is flavoured with cardamom, raisins, saffron, cashew nuts, pistachios or almonds. It is typically served during a meal or as a dessert. It is also known in some regions as payasam, payasa, gil-e-firdaus and fereni.In South Asia, kheer is prepared and eaten on almost every festival. It is also offered to Hindu deities as a bhog or prasadam. The dish is also consumed during Muslim weddings and prepared for the feasts of Mulsim festivals such as Eid ul-Fitr and Eid ul-Adha. A similar dessert, known as firni, is eaten among the Muslim communities of India, Pakistan, and Afghanistan. Today, restaurants offer firni in a wide range of flavours. On a stove top boil the milk once and add washed rice to it. Keep the rice and milk mixture on low heat on the stove top till the rice cooks completely. Keep stirring every few minutes else the milk will burn. In about 40 minutes, the milk and rice mixture should thicken to a custard consistency and appear creamy. If not, cook some more. Add sugar and mix till it dissolves completely. Switch off the stove add a pinch of salt, dry fruits and powdered cardamom. Serve hot or cold as per your preference.